In book form, the “commonplace” was where notable ideas, quotes, and images were collected as snippets and assembled together. The term implies a physical aggregation, but actually derives from a Greek phrase that referred to “general themes” — broad perspectives configured and presented as arguments, often for wide application. Our common places carry both these meanings: shared geographies with a set of inherent topographical and ecological features, but also places with which people form individually unique and diverse relationships. A wild salmon takes a break from carving out its nest, or redd, in a streambed. A century ago, the rock piles from these spawning excavations reportedly blocked steamboat traffic up the Columbia River. Photo by Neil Ever Osborne. Few landscapes hold as much of this physical and cultural information as Oregon’s iconic salmon systems — reaching from seashores to mountain slopes, coastal wetlands to high deserts, and including much of society’s past, present, and future ideas about how salmon life history should intersect with our own. The distinction between real and projected features is not as clear as we might think. The science of salmon is something of a “commonplace” itself — a body of work not separate from society’s aspirations as much as an expression of them, a kind of giant scrapbook that reflects and shapes our field of view and the stories we tell. By extension, the management of salmon is not based on the salmon’s world as much as our imagining of their world through the multiple and overlapping filters of our economies, communities, hopes and fears, needs and expectations. This portfolio of images explores two versions of those aspirations as they relate to salmon. It is neither an exposition of now-familiar insults to their once abundant populations, nor a contrived conflict about whether to have salmon at all. Instead, the pictures highlight how the present conditions in which we find ourselves are the legacy of original commitments we made about salmon, extrapolated over 150 years and largely unchallenged . . . until now. In short, this is a story about our stories. One is grounded in nineteenth century agricultural science, and entrusts protection to Production. Its central conceit maintains that industrialization both engendered this crisis and holds the keys to its remediation. We affirm our loyalty to its promise through ever more creative alternatives to salmon swimming up and downstream, ignoring the persistent context of scarcity, the extraordinary complexity and expense necessary to oversimplify what was once free and abundant. Removing Stearns Dam on the Crooked River (2013). 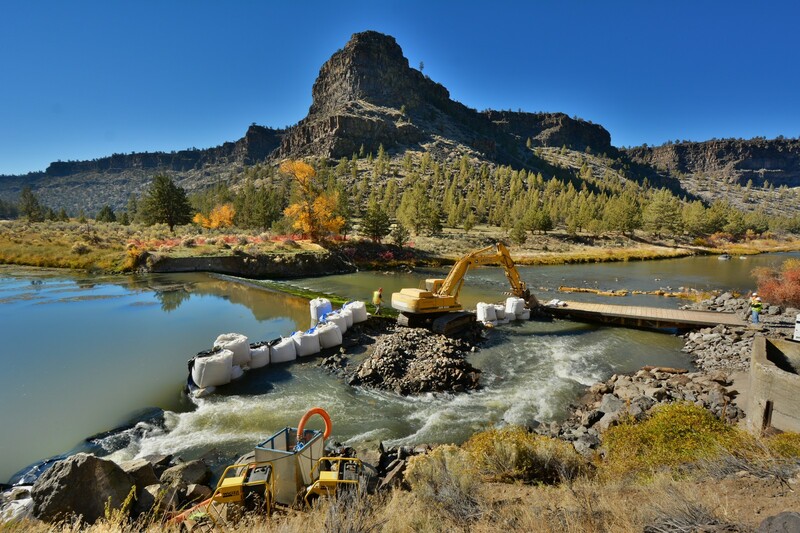 For the first time in 102 years, Chinook and steelhead will access 12 miles of the best habitat in the upper Deschutes watershed. Photo courtesy of American Rivers, in partnership with the NOAA Restoration Center. Photo By Courtesy of American Rivers, in partnership with the NOAA Restoration Center. An alternative, re-emerging story asserts the primacy of Relationships over production, of freedom over control. Throughout the region, on rivers like the Sandy, the Siuslaw, the Rogue, and the Klamath, unlikely collaborations are insisting on renewal — of natural systems, of cultural potential, of legal and moral responsibility to indigenous people, and more. People are examining formerly intractable problems, asking different questions, amending legacy frames, and reaching radically different conclusions with profoundly inspiring results. The Columbia River was once among the most productive salmon systems on Earth, with tens of millions of adults returning each year. The salt marshes, wetlands, and tidal channels of the estuary express the full breadth and complexity of the salmon life cycle. Here, where the river and ocean meet, water temperature, salinity, and food availability vary significantly from area to area, season to season, year to year. Photo courtesy of Salmon: Running the Gauntlet. With no hatcheries and more than 500 miles of undammed waters moving through a kaleidoscope of environments, the John Day is a reference point for understanding and appreciating Oregon’s wild salmon. Oregon’s 111,619 stream miles include many cool, tree-shaded watercourses that provide critical spawning and rearing habitat. Salmon develop adaptations to specific conditions in each stream. Such diversity was the foundation of their resilience and their transformative abundance. Photo courtesy of Salmon: Running the Gauntlet. Salmon anchor our communities, ecosystems, and place-names. A Nez Perce word for a configuration of sticks that formed part of a fish trap, the “Wallowas” still call salmon home — over 500 hundred miles inland and 5,000 feet in elevation in the state’s rugged northeast corner. Photo courtesy of Salmon: Running the Gauntlet. 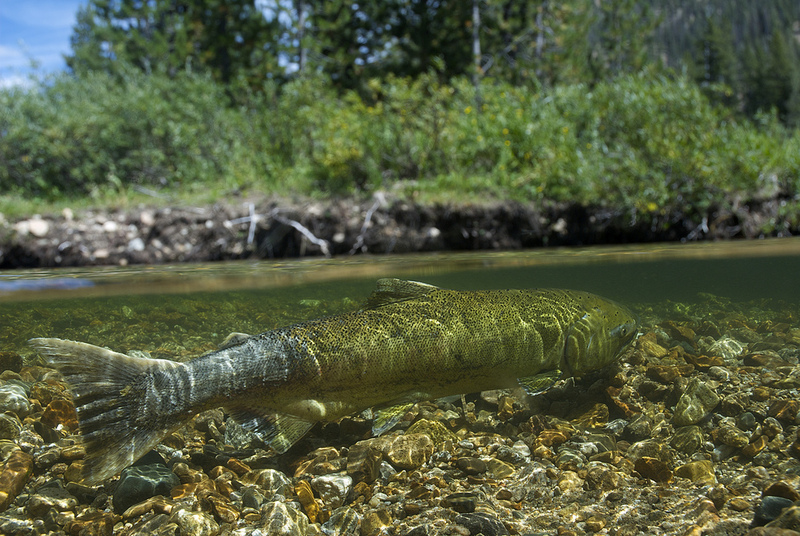 The forests that fish built: animals often carry salmon far from the river. Marine-derived nutrients are found throughout the region’s plant and animal communities. Photo by Sam Beebe. An adult salmon insistently returns to a hatchery sluice. Photo courtesy of Salmon: Running the Gauntlet. Adult salmon are counted as they pass through Bonneville Dam. Photo courtesy of Salmon: Running the Gauntlet. A state-of-the-art hatchery. More than 44 million salmon and steelhead were produced for release into Oregon waters in 2013. Photo courtesy of Salmon: Running the Gauntlet. Juvenile salmon are diverted to a monitoring station at one of the Columbia Basin dams, where they are checked for electronic tags inserted into their nose or abdomen — a kind of bar code for downstream migrants. Photo courtesy of Salmon: Running the Gauntlet. Oregon manages forty-five facilities for fish propagation, rearing, smolt acclimation, and adult trapping, with 177 permanent employees and a budget of $30 million. Many have been operating continuously since the early 1900s. Photo courtesy of Salmon: Running the Gauntlet. A sense of place: spawning salmon will find their way back to the same stream, even the same patch of gravel, where they were born. Photo courtesy of Salmon: Running the Gauntlet. Fertilized salmon eggs develop in the protected, aerated spaces within their gravel nursery. Photo courtesy of Salmon: Running the Gauntlet. “It’s amazing what they do in order to reach the birth houses of these beautiful wilderness streams, these eastern Oregon streams. They give up their lives to put thousands of these little glowing red balls into the stone spine of this continent. It’s this luminous ball. It looks backlit; it looks like the sun. In cold stone, cold water, they find a fire that creates life.” –David James Duncan. Photo courtesy of Salmon: Running the Gauntlet. In their journey from the continent’s rugged interior to the ocean and back again, salmon are a form of correspondence. Photo by Jim Norton. Just short of its life’s final destination, an adult sockeye is scooped from the entrance to its home lake. Photo courtesy of Salmon: Running the Gauntlet. Returning adults await harvesting for a breeding program. Photo courtesy of Salmon: Running the Gauntlet. In the hatchery, biologists and fish culturists combine eggs stripped from females with milt milked from males. For over a century, we have applied our increasingly sophisticated understanding of salmon life history to the problem of their decline. Along the way, we have rationalized the enigmatic, partitioned the indivisible. Confidence in our understanding of parts has become a conceit that we can optimize the whole. Photo courtesy of Salmon: Running the Gauntlet. Salmon populations in the Columbia River have declined over 90 percent, and 80 percent of what remains originate in, and return to, hatcheries. Several research programs in the region seek to understand and mitigate the effects of lost nutrients. Here, frozen blocks of pasteurized Chinook carcasses will be loaded onto backpacks and carried to former salmon streams rendered inaccessible by dam construction. Photo by Jim Norton. Over 27,000 carcasses were placed in Oregon rivers in 2013, as part of the Stream Enrichment Program. Elsewhere in the region, biologists are experimenting with a manufactured product that might supplement or replace the carcass program. Photo courtesy of Salmon: Running the Gauntlet. Photo courtesy of Salmon: Running the Gauntlet. A male sockeye, one of five species of salmon in the genus Oncorhynchus (“hooknose”) that were native to Oregon waters. Dams constructed in the upper Deschutes and Wallowa river systems blocked passage to the lakes in which sockeye historically spawned, extirpating the species in the state. An ongoing reintroduction project aims to re-establish sockeye in the Deschutes. Photo courtesy of Salmon: Running the Gauntlet. From river to river, species to species, and run to run, salmon consistently defy characterization as a single entity, and instead affirm themselves as a network of relationships of previously unimaginable complexity and depth. Photo courtesy of Salmon: Running the Gauntlet. Salmon are the ultimate innovators — many variations in morphology, run timing, habitat preference, and behavior, emerging from a central theme and adapting in response to feedback. Photo courtesy of Salmon: Running the Gauntlet. Both cause and effect of the unique characteristics of Oregon watersheds, abundant wild salmon are inextricable from place. Here, a spawned out salmon's life will soon end where it began, returning critical nutrients to its home stream. Photo courtesy of Salmon: Running the Gauntlet. Juvenile salmon swarm the surface at feeding time. The decorative patterns on the bottom of the raceways are an effort to replace the concrete’s uniform coloration with something salmon would see in nature. Photo courtesy of Salmon: Running the Gauntlet. A regional hatchery’s incubation room maintains a specific and constant environment for developing salmon. Photo courtesy of Salmon: Running the Gauntlet. The counting window beneath Bonneville Dam gives us our first glimpse of how well salmon, and we as managers, are doing. Whether used to justify new harvest regimes or to propose expanded habitat protections, statistical fragments become purposeful narratives. The empirical converted to the notional. Photo courtesy of Salmon: Running the Gauntlet. It’s a bizarre twist of fate that our takeover of salmon reproduction has left them more vulnerable than ever to changing conditions in their environment. Here, a batch of hatchery juveniles wiped out by a virus. Photo by Steve Petit. A returning adult clears the last hurdle before reaching its spawning grounds. Photo courtesy of Salmon: Running the Gauntlet. A juvenile salmon feeds and takes shelter along the shoreline. Photo courtesy of Salmon: Running the Gauntlet. A wild salmon negotiates a waterfall on its way home. Photo courtesy of Salmon: Running the Gauntlet. Juvenile salmon face into the current and use their tails to control the descent from their headwater birth streams. Photo courtesy of Salmon: Running the Gauntlet. Fish “ladders” allow passage around some dams. Photo courtesy of Salmon: Running the Gauntlet. Juvenile salmon are removed from the Columbia and Snake river systems during the peak of their migration to the sea. Reared in hatcheries, driven downstream on trucks or barges, and protected from natural predators like sea lions, the salmon we produce are increasingly dependent on us for their survival. Water sent through the dams to assist juvenile migration is called “spill” — a suggestion that managing the river to resemble itself is both momentary and accidental. Photo by Steve Petit. At certain times of the year, the federal highway system is used to mitigate the federal hydropower system. Trucks carry migrating juvenile salmon around the dams, toward the ocean. Photo by Steve Petit. Part of a bypass flume for outmigrating juveniles at a Columbia Basin dam. Photo by Steve Petit. Juvenile salmon pass the porthole of a bypass pipe. Oregon employs four “regional fish liberation coordinators” and two “regional fish liberation drivers” responsible for the transfer of fish from the hatcheries. Photo by Steve Petit. Jim Norton is Adventure Capitalist / Director of Strategic Partnerships for Ecotrust’s Natural Capital Fund. He is based in San Francisco. In addition to his current work for Ecotrust, he has been a professional river guide and naturalist for the last twenty years and continues to guide in Idaho and on the Colorado River through Grand Canyon. In addition to the rivers of North America, he has worked as a professional guide in China, Chile, and New Zealand. During this time, he also wrote for a number of nature and adventure documentaries. Most recently, inspired by a lost heritage of abundance in salmon streams of his adopted Pacific Northwest home, Jim developed the story for and wrote and produced Salmon: Running the Gauntlet, which aired nationally on May 1, 2011 as an episode of PBS’s Nature. He received a B.S. in biology (Bowdoin College), but prefers the BS around campfires (everywhere). Photo at top and other Salmon: Running the Gauntlet images generously provided by Thirteen/WNET’s Nature series. Go to PBS.org/Nature to screen the entire program.